Starbucks recently partnered with award-winning journalist Rajiv Chandrasekaran from The Washington Post to head up a new media venture. The collaboration between a seasoned journalist and a mega-brand points to an exciting new time for long-form storytelling. Can brands pull it off gracefully? Will consumers accept it? Rajiv Chandrasekaran worked as a staff writer and editor for The Washington Post for more than two decades. He served as bureau chief in Baghdad in the early 2000s, then as a senior correspondent and associate editor for the paper. In late 2013 Chandrasekaran was working on a large-scale research study about veterans for The Post when he met Howard Schultz, CEO of Starbucks. 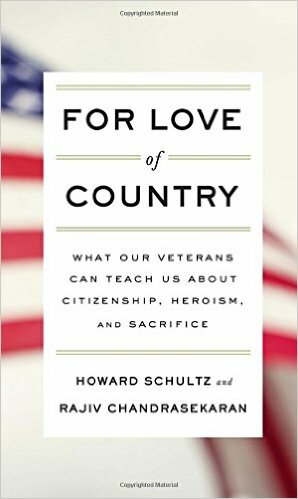 Schultz, who cares deeply about veterans’ issues, asked Chandrasekaran if he would write a book with Schultz. 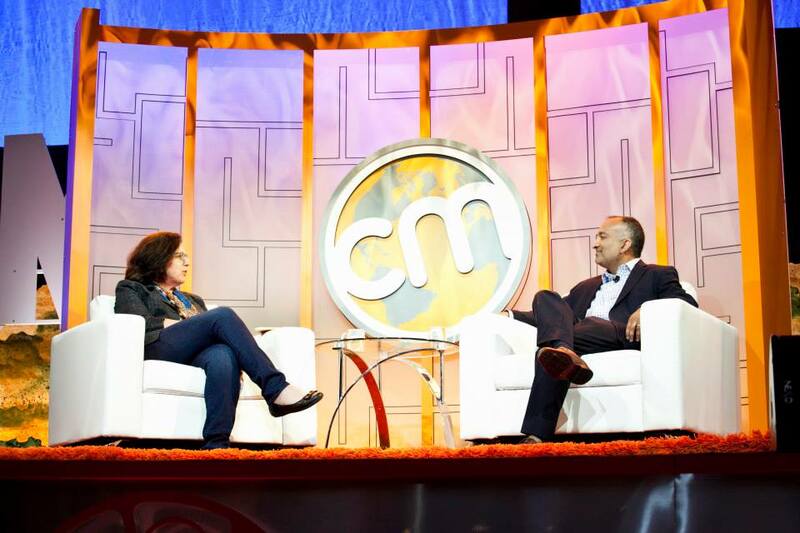 Chandrasekaran sat down with CCO to discuss the collaboration, and explain how this union can serve as a model for other brands wanting to tell compelling stories. He also shared his story at Content Marketing World earlier this month. CCO: I read a book excerpt about the Krissoff family and it moved me profoundly. How did the book project collaboration with Howard Schultz come about? Chandrasekaran: In the late ’90s as a young reporter for The Washington Post, I covered the U.S. government’s antitrust lawsuit against Microsoft. I became friendly with folks on both sides of the case. One of the Microsoft lawyers on that case went on to work at Starbucks and is now the executive vice president for public affairs, and is a close adviser to Howard Schultz. We catch up socially one time per year by phone. He asked me what I was working on. I told him I was working on a project about veterans sponsored by The Washington Post. He told me that Bob Gates (former U.S. secretary of defense) had joined the Starbucks board, that Howard was engaging on some substantial personal philanthropy to support veterans after 9/11, and that Starbucks had committed to hiring 10,000 veterans and military spouses. He then told me that Howard would be coming to D.C. and asked whether I might be interested in meeting him on that trip. Our meeting turned into a two-hour dinner. I presented some raw data from an unprecedented survey of post-9/11 veterans by The Post. Howard was taking it all in. I knew we might have a real connection around this issue when I presented one of the findings that made my eyes pop: 55 percent of post-9/11 veterans feel disconnected from everyday life in America. We sent them to fight for us and they come back to a society they don’t feel connected to. How could this be? It’s profoundly unacceptable. Howard asked, “How can I use my position in public life and the scale of Starbucks to help make a real difference in this area?” That was the genesis of the book project. I’d been writing stories for The Washington Post for years, but the idea of working on a book with someone like Howard – telling a meaningful story, but also getting it in front of people at Starbucks all over the country – it’s a remarkable opportunity to help change the narrative around our veterans. We spent the summer working on it and the book came out in early November right before Veterans Day. It wasn’t just in bookstores but in thousands of Starbucks locations. It was a chance to expose the 95% of America, who either have not served or don’t have direct family members who served, to the remarkable heroism veterans demonstrated in Iraq and Afghanistan. And to show what they are doing now that they are at home. We are pushing against the stereotype that veterans are broken … because there are so many who take their commitment to service and do remarkable things here at home. I went in to the project as a skeptic. What does this successful businessman really want to do here? I wondered if it was all one big PR effort for Starbucks. I came away genuinely convinced that Howard as a person and Starbucks as a company are genuine in their commitment. I never expected to spend time in the corporate world in this way … to make progress on an important social issue. CCO: Do you think what Starbucks is doing is applicable to other companies? Chandrasekaran: I would like to think key elements of what they are doing have universal applicability and can only serve to strengthen other businesses. And develop deeper, more meaningful relationships between those firms and consumers. But it has to be genuine. In the case of Starbucks, it did not jump in to social causes from a standing start. From its earliest days, Starbucks provided health care to part-time employees. As a young man growing up in subsidized housing in Brooklyn, Howard saw what happened to his family when his father was injured and didn’t have health insurance. It created a very strong commitment on his part. Starbucks also took a stand on individuals seeking to openly carry firearms in stores. And Howard sought to rally customers to take a stand against government dysfunction in Washington. As a company, Starbucks established itself as one that wasn’t going to shy away from the important issues of our day. As governments at various levels continue to show themselves incapable of solving some of our most pressing problems, people are looking to other institutions. To the nonprofit sector. Also to corporate America. For example, student loan debt is a crushing problem. 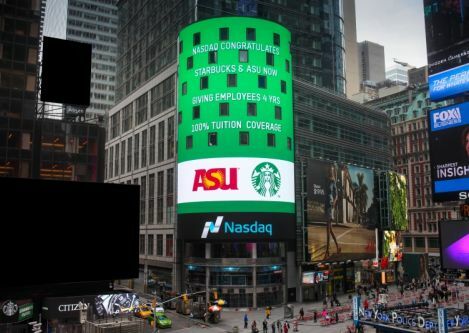 Last year, Starbucks announced that, in partnership with Arizona State University, it would offer two years of a college education via ASU’s online portal. It even allowed part-time baristas a chance to get their diplomas. Earlier this year, it extended the free online education to a full four years. Now Starbucks employees can earn a four-year degree. It changes the model for everyone. It’s showing how an enlightened company can make tangible progress on a critical issue for our country and do it on an issue that has eluded Washington. CCO: Tell us more about the venture you lead for Starbucks. Chandrasekaran: The book project led both of us to conclude that not only did we enjoy working together, but we could make a real, meaningful contribution through the power of storytelling; we could help open the eyes of many Americans about important issues. We thought to ourselves: “What if we did more of this?” And more of this would not have to be in the form of books. Could be television. Film. Digital content. How do you use the power of impactful storytelling to create meaningful social impact? The goal of what I’m trying to do is to give birth to (at the outset) a small suite of projects that will each in its own way educate, inform, and engage Americans on issues we think are important. The first area we’ll focus on is a natural extension from the book … in the veterans’ space. It’s a bold and creative move. I’m not technically a Starbucks employee, though I’m operating with a close connection. I’ll be developing these projects in some cases from the ground up. Others we will simply give lift to. Starbucks will play a role in helping to finance, promote, and even distribute some of those projects. This is part of Starbucks’ broad effort to be more than just the company that sells coffee. It has a role to play to help engage its customers on issues that matter. This is not about glorifying the company directly, selling more coffee or managing public affairs. There’s a social good element to what we are doing … and if done right, it also happens to be good for Starbucks. 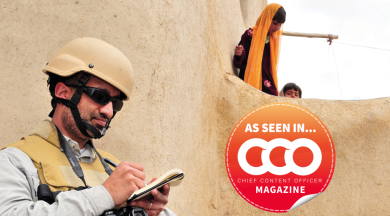 CCO: How do you balance the need to tell weighty stories, while avoiding those topics that feel unwieldy to a brand? 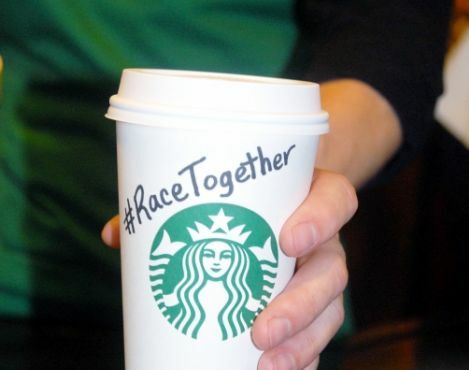 Some topics are so thorny that controversy distracts from the content itself … and I’m thinking specifically about the Race Together initiative by Starbucks. Chandrasekaran: What occurred with Race Together wasn’t about social-impact storytelling. I think there could be compelling projects on the subject of race that someone like me could be engaged with. There are ways to come at controversial topics in constructive and thoughtful ways. It requires care, time, and a degree of commitment from those seeking to tell the story. And of course, you need corporate leaders who are willing to engage it. CCO: What did your colleagues at The Washington Post say when you announced you were joining a branded venture? Chandrasekaran: I expected more skepticism. There was pretty much universal excitement. I made clear I wasn’t leaving because of the paper. I think The Washington Post is doing great work. It’s a once-in-a-lifetime opportunity for me. A lot of my friends and colleagues saw what I did with the book project and quickly recognized the unique and compelling possibilities of doing additional social impact work. And for a lot of people it made sense because of how they see Starbucks. If it was a different sort of company, it might not have been as natural a fit. CCO: What’s different working on the brand side? Chandrasekaran: I’m sure there will be a point where it will start to feel like a challenging transition. For now, the pace is pretty relentless. It feels like I’m back in the newsroom. Starbucks runs on a lot of caffeine. There are a lot of people with a lot of great ideas. And there are a lot of people on the outside wanting to engage. The big challenge for me is figuring out, in a world of a lot of fascinating opportunities, where to target my efforts for maximum impact.